When life gives you soggy humidity and 90 degree days…make gazpacho. Or, at least eat gazpacho. This summery, vegetable-forward soup hailing from Spain typically presents as striking red, and can be akin to slurping salsa. 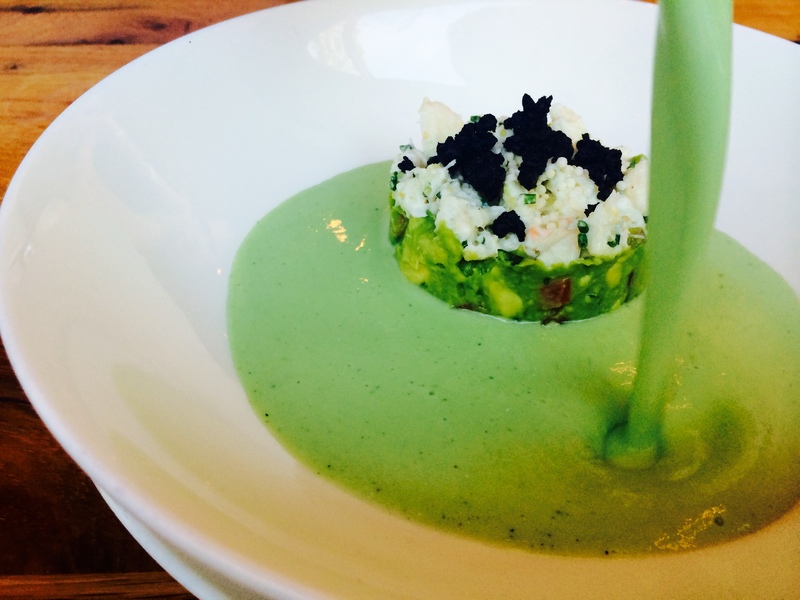 But, Chef Cedric Maupillier takes a different approach at Mintwood Place, yielding The Best Thing on the Menu: Cucumber & Watercress Gazpacho with Crab & Avocado. You still get the punch of Latin flavors thanks to the guacamole and crab-like mound peeking out from the bottom of the bowl, but the harsh tomato and onion flavor of red gazpacho is replaced with cooling cucumber and herbaceous watercress. Black tobiko (poor man’s caviar) punctuates the top of the crab concoction, adding a playful Pop Rocks texture. You’ll find the green gazpacho in the starters section; get it while it’s hot (outside). 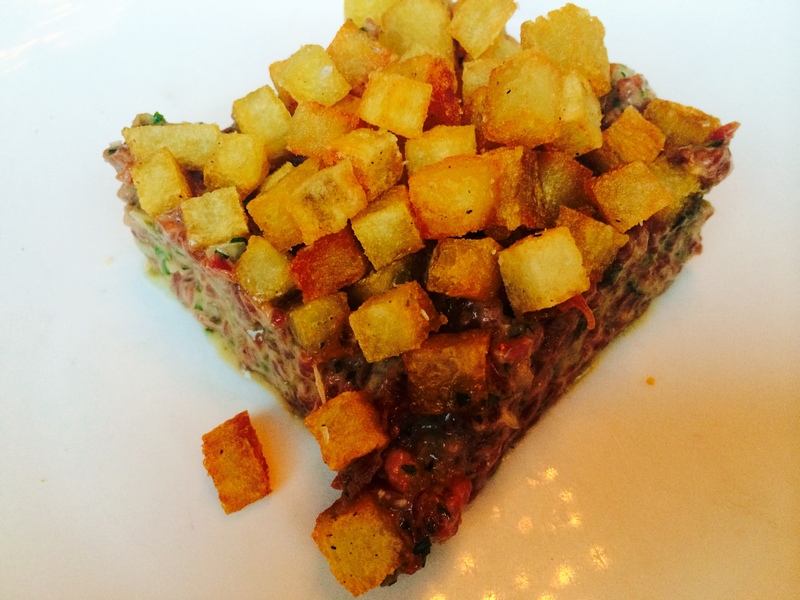 Built like a hedgehog, the potato-spiked beef tartare is also a must-order. If you’re just starting your vampirific raw meat eating career, dabble in the appetizer portion. Veterans can go big by getting the entree. Either way, the meat is minced and seasoned perfectly, threatening what we had previously dubbed the best tartare in DC (the BTDC). A final dish worth noting is the Bacon & Onion Flammekueche. This paper thin pizza is bursting with breakfasty flavor is the perfect way to start a meal with friends because they cut it into easy-to-share rectangles. 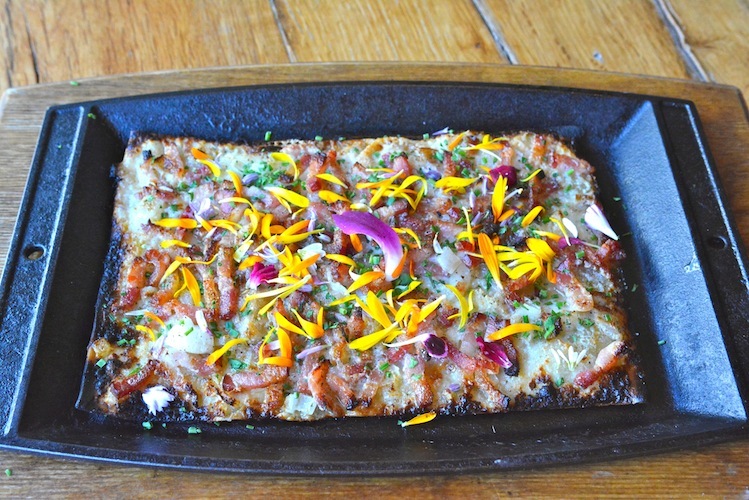 We think they should offer a $1 off your flammekueche if you can pronounce it right on the first try. Green gazpacho not your BTM? Share your favorites in the comments section.